CLICK HERE FOR MY PODCAST ON JOSB. Hello Friends! Thanks so much for stopping by and visiting my blog, Stock Picks Bob's Advice. As always, please remember that I am an amateur investor and that you should consult with your professional investment advisors prior to making any investment decisions based on information on this website. One of the things I like to do on weekends on the blog is to review my holdings that I really do own in my trading portfolio. Fully invested, I would have 25 positions. However, with the recent sell-off in the market, and my own liquidation of several of my positions, I am now down to 18 positions. Trying to review these holdings about once/year, I am reviewing positions, going alphabetically, every other week. Two weeks ago I reviewed JLG Industries (JLG) on Stock Picks Bob's Advice. This holding has subsequently been sold from my trading portfolio. Next alphabetically to review is Jos.A. Bank (JOSB). I currently own 187 shares of Jos. A. 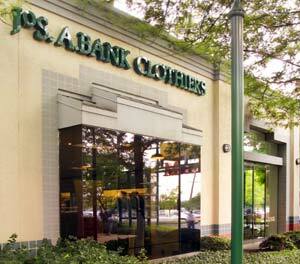 Bank Clothiers (JOSB) which were purchased a little over a year ago on 4/4/05, with a cost basis of $25.59/share. JOSB closed at $36.66/share on May 19, 2006. I thus have an unrealized gain of $11.07 or 43.3% since purchasing these shares. As is my strategy, I have sold shares of JOSB out of my portfolio twice, having sold 60 shares 6/7/05, and another 30 shares on 1/30/06 at the 30% and 60% appreciation levels. Thus, on the upside, my next sale would be at a 90% gain on the upside or 1.9 x $25.59 = $48.62/share. On the downside, if the stock continues to retrace its gains, I shall be selling at the 30% appreciation level (1/2 of the top sale at 60% appreciation), or 1.3 x $25.59 = $33.27. Let's take another look at this company and see if it still has the characteristics that led me to pick this stock for my own porfolio. 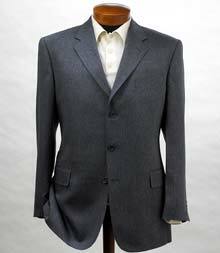 "...engages in the design, retailing, and marketing of men’s tailored and casual clothing and accessories. 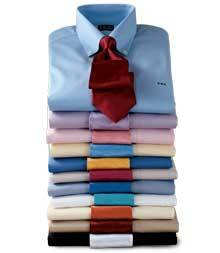 Its product line includes tuxedos, suits, shirts, vests, ties, sport coats, pants, sportswear, overcoats, sweaters, belts and braces, socks and underwear, branded shoes, and other items." On April 12, 2006, Jos. A. Bank reported 4th quarter 2005 results. Total sales for the fiscal fourth quarter of 2005 increased 28.1% to $163.8 million, up from $127.9 million in the same period the prior year. Net income increased to $18.5 million, up from $12.6 million the prior year. On a diluted per share basis, earnings increased from $.71/share in 2004 to $1.02/share in fiscal 2005 fourth quarter. Comparable store sales rose 15.9% in the fourth quarter and internet sales climbed 18.9% in the quarter from the prior year same period. The company beat expectations for the period coming in at $1.02/share when according to Thomson Financial, analysts were expecting $.98/share. Revenue of $163.8 million also beat expectations of $162.5 million. Checking for the latest news on sales, JOSB reported April, 2006, same-store sales results on May 4, 2006. For stores open at least a year, sales rose 7.3% in April. This beat analysts expectations of a 7.2% increase. Catalog and internet sales grew 7.7% and the combined total sales for the month were $38.4 million, up 17.8% from the prior year. 3. How has the company been doing long-term? Reviewing the "5-Yr Restated" financials on JOSB from Morningstar.com, we can see the steady growth in revenue from $211 million in 2002 to $372.5 million in 2005 and $464.6 million in 2006. Earnings have also steadily increased from $.44/share in 2002 to $1.38/share in 2005 and $1.95/share in 2006. No dividends are paid. The company has slighly increased the float with 15 million shares outstanding in 2004, increasing to 17 million in 2006 and 18 million in the trailing twelve months (TTM). Free cash flow which was a negative $(31) million in 2004, turned positive at $22 million in 2005, and was $5 million in 2006. The balance sheet appears satisfactory with $7.3 million in cash and $195.9 million in other current assets reported. This total current assets of $203.2 million, when balanced against the $107.1 million in current liabilities, gives us a current ratio of 1.90. As has been explained on About.com, a current ratio of 1.5 or higher is generally considered 'healthy'. Morningstar reports JOSB with $43.9 million in long-term liabilities. Reviewing the Yahoo "Key Statistics" on Jos. A. Bank, we find that this is a mid-cap stock with a market capitalization of $659.77 million. The trailing p/e is a very reasonable (imho) 18.75, with a forward p/e (fye 28-Jan-08) of 13.28. This results in a PEG (5 yr expected) of only 0.67, another indication of good value for this stock. Examining the Fidelity.com "eresearch" website, we find that JOSB has been assigned to the "Apparel Stores" industrial group. Within this group, Jos. A. Bank appears fairly valued with a Price/Sales ratio of 1.4. Leading this group is Chico's Fas (CHS) with a Price/Sales ratio of 4, followed by American Eagle (AEOS) at 2.2, Abercrombie & Fitch (ANF) at 2, Jos. A. Bank (JOSB) at 1.4, Limited (LTD) at 1.2 and Pacific Sunwear (PSUN) at 1.2. Thus, valuation by this measure also looks favorable for JOSB. Finishing up with Yahoo, we see that there are 18 million shares outstanding with 17.30 million of them that float. As of 4/10/06, there were 5.07 million shares out short, representing 29.10% of the float or 12.5 trading days of volume. This looks quite significant to me, and may bode well for the stock if any significant good news or price move which could 'squeeze' the shorts. As noted above, no cash dividends are paid, and the last stock split was a 5:4 split on 2/16/06. 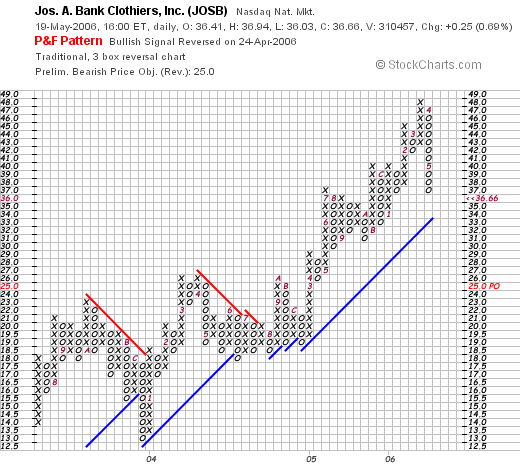 Reviewing the "Point & Figure" chart on JOSB from StockCharts.com, we can see the steady improvement in stock price from the $14 level in July, 2003, to a peak of $48/share in March, 2006. The stock has recently corrected, along with the market, to the current level of $36.66/share. The stock does appear to be above support lines, which appear to be at the $34 level. Let's review some of the things I noted above. First of all the latest quarterly report was strong with both revenue and earnings coming in above expectations. The Morningstar page was strong with steady revenue and earnings growth. The company has increased the float slightly which is a small concern. Free cash flow, while erratic, has been positive recently. The balance sheet is good with a current ratio of almost 2. Finally valuation looks nice with a p/e under 2.0 and a PEG under 1.0. The Price/Sales ratio is near the lowest of the group. 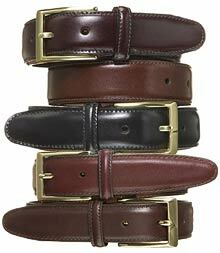 In addition, there are a lot of sales already out short, which could contribute to supporting the stock price. The recent correction in the price is certainly of concern, and in fact, if the stock should fall another few points it shall be hitting my exit price. Meanwhile, things look encouraging. Thanks so much for stopping by and visiting! If you have any comments or questions about this stock or anything else on the blog, please feel free to leave your comments, or you can email me at bobsadviceforstocks@lycos.com. Please be sure to drop by and visit my Stock Picks Bob's Advice Podcast Website where you can hear me discuss many of the stocks and issues addressed on the blog! In order to determine how my stock picks have turned out, I have been trying to review past stock picks each weekend. I am currently about 60 weeks out with this review process. Each weekend I review picks from that trailing period and advance a week the following weekend. This review assumes a "buy and hold" strategy. In fact, I practice and recommend a disciplined portfolio management strategy involving selling losing stocks quickly and completely when they hit 8% losses and selling gaining stocks slowly and partially as they appreciate. This strategy will affect performance; for the sake of simplicity, I shall continue to evaluate past picks assuming a buy and hold approach, but please be aware that investment performance would be quite different with a different portfolio strategy. On February 28, 2005, I listed Alamo Group (ALG) on Stock Picks Bob's Advice when it was trading at $24.80/share. ALG closed at $21.33 on 5/19/06 for a loss for the pick of $(3.47) or (14.0)%. 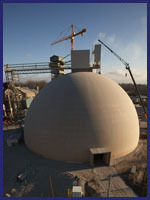 On May 3, 2006, Alamo Group announced 1st quarter 2006 results. Net sales grew 14% to $104.4 million compared to $91.3 million in the same quarter last year. However, excluding revenue from the acquisition of Spearhead Machinery, net sales would actually have been $87.8 million, a decrease of 4% from last year's results. Net income for the quarter came in at $1.9 million or $.20/diluted share down from $2.6 million or $.26/diluted share last year. There wasn't too much imho, to be excited about this report. On March 2, 2005, I posted Pacific Sunwear (PSUN) on Stock Picks Bob's Advice when it was trading at $28.52. PSUN closed at $22.68 on May 19, 2006, down $(5.84) or (20.5)% since posting. On May 11, 2006, PSUN announced 1st quarter 2006 earnings. Net sales for the quarter ended April 29, 2006, were $299.9 million, up 7.1% over sales of $280.0 million for the quarter ended April 30, 2005. Net income for the first quarter 2006 was $11.9 million or $.16/diluted share, down from $17.6 million or $.23/diluted share in the same period a year earlier. Indicative of the problems facing this company, same store sales decreased 1.8% for the comparable 13 week period ended April 29, 2006. Again, there wasn't much to 'write home about' on this stock! Finally, on March 4, 2005 I posted Perficient (PRFT) on Stock Picks Bob's Advice when it was trading at $9.33. PRFT closed at $13.00 on May 19, 2006, for a gain of $3.67 or 39.3% since posting. On May 3, 2006, Perficient reported 1st quarter 2006 results. For the quarter ended March 31, 2006, total revenue climbed 50% to $29.6 million compared to $18.3 million during the first quarter of 2005. GAAP earnings climbed 17% to $.07/share up from $.06/share during the same quarter last year. Of the three stocks, this stock had the only positive quarterly report imho and represented the only stock making a nice gain! So how did I do picking stocks for that week back in early 2005? Well, there were two losing stocks and one gaining stock. Fortunately, the one gaining stock made up for the two losers and the three stocks had an average gain of 1.6%. Not too exciting, but positive in any case :). Thanks so much for stopping by and visiting! If you have any comments or questions, please feel free to leave them on the blog or email me at bobsadviceforstocks@lycos.com. If you get a chance, please visit my Stock Picks Bob's Advice Podcast Site where you can hear me discuss some of the stocks and questions I face on the blog! Hello Friends! 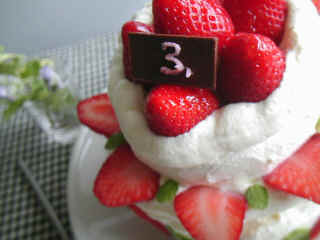 Just a quick note to let you know that I am now celebrating my third birthday on Stock Picks Bob's Advice! Please enjoy a slice of my birthday cake! And how did that pick do? Well, St. Jude has been under pressure recently. But with the 2:1 stock split on November 23, 2004, my pick price was actually $27.65. With STJ closing at $35.38 on 5/19/06, this still represents a gain of $7.73 or 28% since posting. Not fabulous, but not that bad either :). And by the way, since the original post in May, 2003, I have now had 1,216 entries on this blog! My visit count is now up to 63,805, with 186 visits per day on the average. Just this past week I had 1,303 visits to my blog. Other facts: I have a 'Xanga Shadow Blog, where I post almost all of my blogs from Tripod. In addition, I now have a podcast website, where for the past six months, my first podcast was on November 27, 2005, and where I now rank in the top ten podcasts out of over 8,500 podcasts on Podomatic! It has been a blast! Thanks so much for visiting my blog and making all of this possible. If you have any comments or questions, please feel free to leave them on the blog or email me at bobsadviceforstocks@lycos.com. I came across Eagle Materials (EXP) yesterday, and wanted to write this one up this weekend before the market opens once again Monday morning. I do not own any shares of EXP or have any options. Eagle made the list of top % gainers Friday and closed at $52.21 on 5/19/06, up $2.49 or 5.01% on the day. Let's take a closer look at this company and see why I thought it attractive enough to include on this blog. "...engages in the manufacture and sale of basic building materials used primarily in commercial and residential construction, and public construction projects in the United States. The company engages in the mining of gypsum and limestone; manufacture and sale of gypsum wallboard; and in the manufacture, production, distribution, and sale of portland cement." 2. How did the company do in the latest reported quarter? 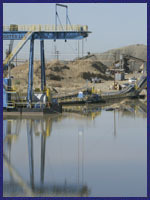 On May 2, 2006, Eagle Materials reported 4th quarter 2006 results. For the quarter ended March 31, 2006, revenue came in at $221.6 million, up 45% over the $153.3 million in revenue for the same quarter last year. Net earnings were $43.8 million, up 59% from $27.5 million in net earnings for the same period in the prior year. On a diluted per share basis, earnings increased 76% to $.86/share, up from $.49/share in the same quarter last year. Reviewing the "5-Yr Restated" financials on EXP from Morningstar.com, we can see the steady growth in revenue from $367.2 million in 2001 to $616.5 million in 2005 and $791.4 million in the trailing twelve months (TTM). Earnings dropped from $1.07/share in 2001 to $.72/share in 2002. However, since 2002, earnings have steadily increased to $1.91/share in 2005 and $2.67/share in the TTM. The company also pays a dividend, with $.07/share reported in 2001, increasing to $.40/share in 2005. (It appears that the company paid a special dividend in 2004 when $2.15/share is reported on Morningstar.com). The number of shares outstanding has been quite stable with 55 million in 2003, decreasing to 50 million in the TTM. Free cash flow is solidly positive with $106 million in 2003, dropping to $100 million in 2004 and increasing to $135 million in 2005. The balance sheet appears satisfactory with $60.2 million in cash and $147.3 million in other current assets resulting in total current assets of $207.5 million, which, when compared with the $114.8 million in current liabilities yields a current ratio of 1.81. Anything 1.5 or higher is generally considered a healthy ratio. The company has $315 million in long-term liabilities. Reviewing the Yahoo "Key Statistics" on Eagle Materials, we can see that this company is a mid-cap stock with a market capitalization of $2.63 billion. The trailing p/e is nice at 17.29, and the forward p/e is even better (fye 31-Mar-08) of 10.02. The PEG (5 yr expected) is quite reasonable at 0.30. Thus the company is anticipated to grow its earnings at three times the rate suggested by the p/e ratio. Looking at the Fidelity.com eresearch website, we find that Eagle Materials is in the "cement" industrial group, and within this group EXP is at the top in terms of richness of valuation with a Price/Sales ratio of 3.5. EXP is followed by Florida Rock (FRK) with a Price/Sales ratio of 2.8, Cemex SA (CX) at 1.6, and Texas Industries (TXI) at 1.1. Finishing up Yahoo, we see that there are 50.32 million shares outstanding with 47.97 milion that float. Currently, as of 4/10/06, there are 9.38 million shares out short, representing 18.80% of the float or 8.5 trading days of volume. This appears significant to me and may represent some of the buying pressure we observed Friday. As already noted, the company pays a small dividend of $.70/share yielding 1.40%. The last stock split was a 3:1 split in February, 2006. 5. How does the chart look? 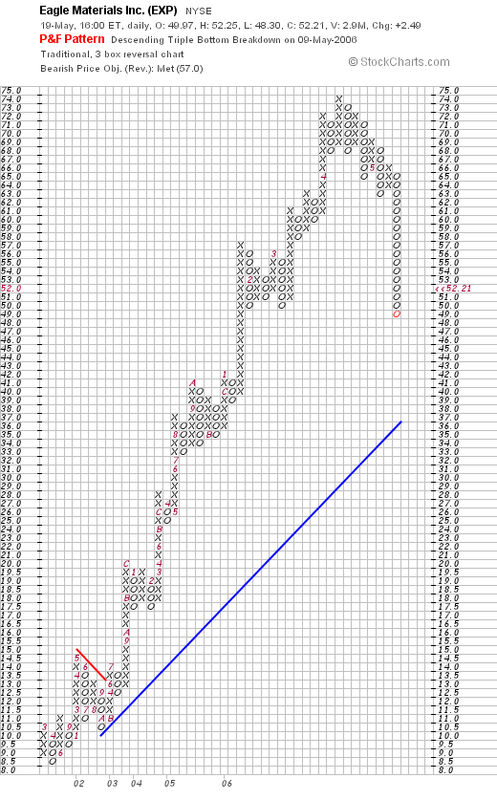 Looking at the "Point & Figure" chart on EXP from StockCharts.com we can see that the latest market correction is taking its toll. The stock has traded strongly since at least March, 2001, when the stock was at $10.50, climbing to a peak of $74 in April, 2006, before pulling back to the $49 level this month. The stock appears to be well above its support level and does not appear to have broken down technically. 6. Summary: What do I think? Let's review some of the information from this post: first, the earnings were superb with solid revenue growth and earnings growth reported recently. The last five years, at least since 2002, have been solid as well with regular earnings and revenue growth reported. The company pays a small dividend and has been increasing the dividend. The number of shares outstanding has been stable and in the past 12 months has decreased. Free cash flow is positive and growing. And the balance sheet appears solid. Valuation-wise the p/e and PEG are cheap, but the Price/Sales ratio is a bit steep. Finally, the chart, which has pulled back some this past month, still appears to be above support levels and given the proper market environment might once again resume its rise. In other words, if I did have permission to be buying a stock, this is the sort of company that would be on my "short list". Thanks again for visiting! Please feel free to drop me a line at bobsadviceforstocks@lycos.com if you have any comments or questions. Always feel free to leave your comments right on the blog as well. Finally, please be sure to come and visit my Stock Picks Bob's Advice Podcast Site where I discuss many of the same stocks I write about on the blog. A few moments ago I sold my remaining 84 shares of Hibbett (HIBB) at $24.56. Yesterday, after the close of trading, HIBB reported 1st quarter 2007 results. While earnings were up 12.9% over last year, and net sales were up 10.5%, the number that gave me pause was the same store sales report, which, for the quarter was down 0.07%. Since the market is overall quite weak, I went ahead and pulled the plug on this holding with fundamental weakness in sales. These shares were initially acquired 3/6/03 with a cost basis of $6.50/share. Thus, even though the stock is down sharply today, I sold with a gain of $18.06/share or 277.8% since my purchase of this stock. It is a bit sad to part with such a great company like Hibbett in the portfolio, but the same store sales reports gave me a great deal of concern. Thanks so much for stopping by! If you have any comments or questions, please feel free to drop me a line at bobsadviceforstocks@lycos.com or just leave them on the blog. Be sure to visit my Stock Picks Bob's Advice Podcast Site where I talk about many of the same companies I write up on the blog. One of my greatest challenges as an investor is knowing how to deal with market declines and investment losses. 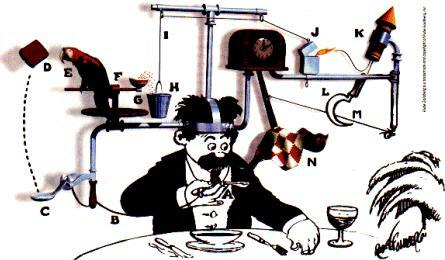 One would like to have something automatic like this Rube Goldberg machine. In other words, to have a trading system that will diminish your losses in a bear market and maximize your gains in a bull market. Too often we find our emotions working against our own best interests. When investments decline we rationalize the losses and defer the realization implicit in a sale of holdings at a price below their cost. This exposes our investments to greater losses and delays the eventual 'day of reckoning'. In the same fashion, as stocks move higher, our greed overcomes our rational thoughts and we delay realizing some of the gains by selling a portion of the holding, and instead allow our dreams of larger and greater profits override our need to 'lock-in' some gains with a sale. Within every successful trading system there should be a method of avoiding the problem of compounding one's losses while at the same time encouraging the compounding of gains. In other words, when investments within a portfolio develop losses, they should be sold at a predetermined price point and the proceeds from such sales should not be re-invested; instead, the proceeds should be kept in cash to be re-invested when an appropriate buy signal occurs. In the same fashion, when stocks are sold on 'good news' events, such as price appreciation, this should also be considered a bullish indicator and the proceeds from such good news sales should be re-invested in a new stock position. I have expressed this strategy as being hardest on declining stocks that are sold completely and quickly on developing losses, and easiest on gaining stocks which are on the other hand sold slowly and partially as they appreciate in price. This bias will also select for the strongest stocks within your portfolio. A strategy with pre-determined sale points both on the upside and downside reduces trading stress as one simply needs to review the stock price to determine one's action. It is the requirement for arbitrary decisions that may lead to over-trading as well as under-trading of one's holdings. No system can respond quickly enough to avoid all losses and lock in all gains. However, having a system that can move one's holdings back and forth from equities to cash and back again, should be helpful in the long-run in building one's assets by maximizing gains and minimizing losses. Wishing my readers the very best of luck in dealing with the difficult investing environment we are all facing! 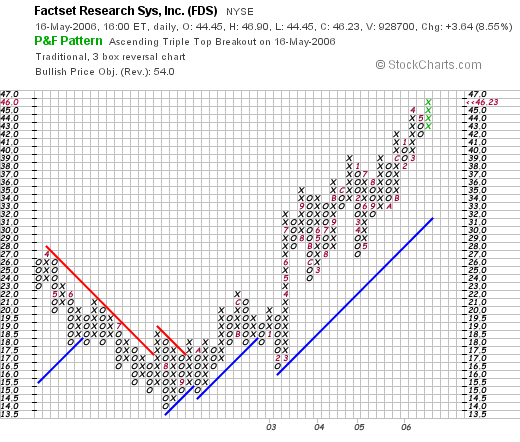 I was looking through the list of top % gainers on the NYSE today and saw that an 'old favorite' of mine from this blog, FactSet Research Systems, Inc. (FDS) was on the list. In fact, FDS closed at $46.23, up $3.64 or 8.55% on the day. I do not have any shares or options on this stock. I first posted FDS on Stock Picks Bob's Advice on June 17, 2003, when it was one of the first selections on this blog, trading at $40.39/share. Adjusted for a 3:2 stock split on February 7, 2005, this pick was actually selected at a price of $26.93/share. Thus, with the stock closing at $46.23, this represents an appreciation of $19.30 or 71.7% since I first 'picked' the stock here on the blog. Almost exactly a year ago, on May 18, 2005, I again posted FactSet (FDS) on Stock Picks Bob's Advice, when it was trading at $31.53. With today's close at $46.23, the stock has appreciated $14.70 or 46.6% since posting in the past year. And today, with the stock once again on the move, I have posted FDS on Stock Picks for the third time! Let's take a closer look at this company and let me show you why I believe it deserves another review! "...supplies economic and financial data and analytics to the investment community worldwide. The company’s applications provide users access to company analysis, multicompany comparisons, industry analysis, company screening, portfolio analysis, predictive risk measurements, alpha and backtesting, portfolio optimization, and real-time news and quotes." 2. What about the latest quarterly results? 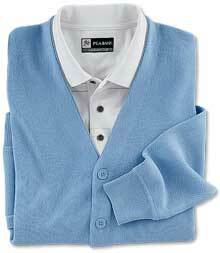 On March 21, 2006, FactSet reported 2nd quarter 2006 results. Revenue for the quarter came in at $93.7 million, up 23% from the prior year's $76.5 million and also beating consensus of $92.3 million expected. Net income grew to $19.2 million or $.38/share, up from $17.2 million or $.34/share the prior year. This also beat expectations of $.37/share as reported. In addition, the company raised guidance on the upcoming quarter for revenue, with $95-$97 million now expected, up from analysts' expectations of $94.9 million. Thus from my perspective this quarterly report did everything right: reporting increased revenue, increased earnings, exceeding expectations and raising guidance. Something I call the "trifecta plus"! Reviewing the "5-Yr Restated" financials on FDS from Morningstar.com, we find first of all that revenue growth has been uninterrupted with $167.6 million in 2001 growing to $312.6 million in 2005 and $345.4 million in the trailing twelve months (TTM). Earnings during this period have also steadily grown from $.64/share in 2001 to $1.43/share in 2005 and $1.52/share in the TTM. An added bonus is the fact that the company pays a dividend which has also been steadily increased from $.09/share in 2001 to $.20/share in 2005. Interestingly, the company has been retiring shares with 51 million in 2002, dropping to 48 million in 2005 (although rebounding slightly to 49 million in the TTM). Free cash flow has been positive with $66 million reported in 2003, $45 million in 2004, $72 million in 2005 and $99 million in the TTM. The balance sheet also looks solid with $90.2 million in cash which by itself can pay off both the $66.4 million in current liabilities and the $18.0 million in long-term liabilities comgined. Calculating the 'current ratio' gives us a total of cash and other current assets at $157.4 million, which when compared to the $66.4 million of current liabilities results in a current ratio of 2.37. Reviewing Yahoo "Key Statistics" on FactSet Research, we find that this is a mid-cap stock with a market capitalization of $2.25 billion. The trailing p/e is a bit rich at 30.29, with a forward (fye 31-Aug-07) p/e of 25.97. The PEG is also a bit rich with a ratio of 1.62. The Fidelity.com eresearch website demonstrates that in terms of the Price/Sales ratio, FDS is also richly priced with a ratio of 6.3 leading the "Information/Delivery Services" industrial group. Following FactSet is Wright Express (WXS) at 4.9, Jupitermedia (JUPM) at 4.4, Alliance Data Systems (ADS) at 2.6 and DST Systems at 1.8. By this measure as well, FDS is priced richly. Returning to Yahoo, we find that there are 48.68 million shares outstanding with 37.61 million that float. As of 4/10/06, there were 2.32 million shares out short representing 5.6% of the float or 8.2 trading days of volume. I believe any short interest over 3 days is significant and may contribute to a "squeeze" of the short sellers. As noted earlier, the company pays $.20/share in dividends yielding 0.5%. Also as noted above, the company last split its stock in a 3:2 fashion. We can see that this stock actually was trading lower from $28/share in April, 2002, to a low of $14/share in August, 2002. Since bottoming at that time, the stock has actually been trading stronger, first breaking resistance at $17, and now moving sharply higher to close at $46.23, which appears to be a new high for the stock. Let's review some of the things that I have discussed above on this stock. First of all, the stock moved nicely higher today on an upgrade from Piper Jaffray. The latest quarter showed everything I like to see in a quarterly report: revenue growth, earnings growth, beating expectations and raising guidance. The Morningstar.com report is also quite nice with steady revneue and earnings growth the past few years. The company even pays a small dividend and has been increasing it each year. In addition, the company has reduced the number of shares outstanding which is also an important detail of this analysis. 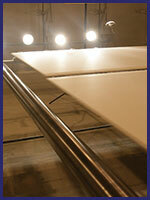 The company is generating an increasing level of free cash flow and has a strong balance sheet. Valuation wise, the p/e is above 30, the PEG is just over 1.5, and the price/sales is just a little over 6, making it the priciest stock in its industrial group. On a postiive note the relatively large amount of short interest may be supportive and may even be driving the stock higher in the face of solid earnings. And finally, the stock chart looks strong and does not appear overextended. I like FDS but it is not a 'bargain'. Any blemish could find this stock correcting. However, there are few other stocks with as consistent a growth bias as FactSet and this has been an excellent pick for me as demonstrated by the price appreciation from 2003 and 2005. Unfortunately I don't own any of these shares! Thanks so much for stopping by and visiting. If you have any comments or questions, please leave them on the blog or email me at bobsadviceforstocks@lycos.com. If you get a chance, please do come and visit my Stock Picks Bob's Advice Podcast Site. As part of my trading strategy, I am selling stocks that hit 8% losses. After a sale, I 'sit on my hands' and leave the proceeds in cash (or as more accurately is the case, I pay down my margin.) I don't second guess what the market is telling me through my portfolio. This afternoon, with the market turning down once again, my JLG stock hit a sale point. I had purchased 320 shares on 1/12/06 (note that my latest purchases are being sold first), at a cost basis of $25.81. A few moments ago, I sold all 320 shares at $23.67 for a loss of $(2.14) or (8.3)%. No matter how much I like JLG or CNXS or ANGO, these stocks were sold because my trading strategy dictated their sale. And out they went. I shall be applying the proceeds to my shrinking margin level, and waiting for a stock to hit an appreciation target instead of a sale point, to add a new position to the portfolio. Meanwhile, I am battening the hatches. Thanks so much for visiting! If you have any comments or questions, please feel free to leave them on the blog or email me at bobsadviceforstocks@lycos.com. Please also come and visit my Stock Picks Bob's Advice Podcast Site. One of the things I try very hard to do is to 'practice what I preach' :). As much as I 'like' my holdings, I am pretty cold-hearted and will part with them as they hit sale points on the downside. Case in point is CNS, (CNXS), which a few moments ago, hit my 8% loss limit on the downside and was sold. You can see that in the face of a market correction, the first stocks to go are the most recent purchases that are most vulnerable for a sale. I just purchased these 240 shares on 5/5/06, at a cost basis of $24.44/share. A few moments ago I sold my 240 shares at $22.37, for a loss of $(2.07) or (8.5)% since purchase. Again, as part of my strategy, I shall refrain from reinvesting the proceeds until such time as I have a sale of a portion of a stock at a gain, on what I call good news. You can see that my portfolio, which if I didn't have any margin, would currently be moving into cash as the market declined. It will be interesting to see how this works out as things proceed. In any case, thanks so much for stopping by! If you have any comments or questions, please feel free to leave them on the blog or email me at bobsadviceforstocks@lycos.com. Also, remember to stop by and visit my Stock Picks Bob's Advice Podcast Site. One of the weekend tasks I like to address on this website, is to look at past stock picks and find out how they 'turned out'. For the purposes of this review, I assume a 'buy and hold' strategy of stock purchases. However, in real life, I actually recommend and practice a disciplined portfolio management system that requires me to sell stocks if they hit an 8% loss after an initial purchase, and to sell 1/6th of my holdings of stocks as they hit targeted appreciation points. This will definitely change actual investment performances however, for the sake of this review, a 'buy and hold' strategy is an easier approach to get a feel for the performance of these stock picks. During the week of February 21, 2005, I only made one stock 'pick' which in itself was a revisit of an earlier post. On February 26, 2005, I picked Synaptics (SYNA) for Stock Picks Bob's Advice when it was trading at $24.33. Synaptics closed on May 12, 2006, at $24.42, up $.09 from the initial pick, virtually unchanged, with a calculated gain of .4% since being 'picked'. On April 20, 2006, Synaptics reported 3rd quarter 2006 results. For the quarter ended March 31, 2006, net revenue came in at $40.4 million, down from $56.7 million for the same quarter the prior year. Net income for the quarter was $1.6 million or $.06/diluted share, compared with $11.7 million or $.38/diluted share in the third quarter of the 2005 fiscal year. So how did I do that week? Well, there was only one stock 'picked'; ironically, I had a very slow week in picking stocks this week as well. And that stock, Synaptics, had a 0.4% gain. Nothing to write home about I guess. Thanks so much for stopping by and visiting! If you have any comments or questions, please feel free to leave them on the blog or email me at bobsadviceforstocks@lycos.com. Also, please remember to stop by and visit my Stock Picks Bob's Advice Podcast Site where you can listen to me discuss many of the same stocks on my blog and also answer some readers questions regarding my trading strategy and individual stocks.